For years pregnant women have been told to limit their fish consumption due to high levels of mercury in some types of seafood. However, a recent study has found pregnant women who eat some of the same fish they’ve been told to avoid may confer protective effects on fetal brain development and protection against autism. A study of almost 2,000 pairs of mothers and children from the Spanish Childhood and Environment Project assessed the first trimester of pregnancy to the 5th year of life. Researchers wanted to find out if seafood was beneficial to children’s neuropsychological development. Among the fish mothers ate were swordfish, albacore tuna, shell fish, mackerel, sardines, anchovies, salmon, hake and sole. Researchers tested the mothers’ levels of vitamin D and iodine, while umbilical cord blood was tested for mercury and other pollutants. Using the Childhood Asperger Syndrome Test and the Bayley and McCarthy child development scales, scientists began to assess the children when they reached 14 months of age to measure development and ability. At about 5 years old, the children of mothers who had a diet high in fish had higher cognitive scores and fewer autism spectrum traits. For every 10 grams of increase in “dose” beyond the 340 gram U.S. recommended amount, the children had additional small increases in cognitive test scores. For instance, eating 600 grams of fish per week was linked to a 2.8 point additional increase in IQ score. “We saw the greatest benefits to the cognitive development of the children [who] were given to the consumption of large fatty fish, followed by lean and small fatty fish,” says study author Jordi Júlvez. Eating fish had the greatest impact on children when mothers ate it during the first trimester of pregnancy. The benefit is most likely from the high omega-3 fatty acids found in fish, which are vital to neural development and brain function. Past research shows it’s safe to eat ocean fish because most seafood is high in selenium, and selenium purifies the body of mercury. U.S. health regulators currently recommend pregnant women avoid large fish such as swordfish, shark, king mackerel, or tilefish from the Gulf of Mexico. The current study, however, found no adverse effects from eating larger fish, such as Bluefin tuna. Mercury and DHA, an omega-3 fatty acid, were found in higher levels in the babies’ umbilical cord blood, but researchers say they didn’t notice a negative correlation between mercury and the children’s neurodevelopment. Researchers also found that pregnant women who ate up to 600 grams of fish each week were not affected by polychlorinated biphenyls (PCBs) linked with the food. It’s possible that the benefits of omega-3s canceled out the negative effects of both kinds of pollutants. “It seems that our mercury indicator is telling more about fish consumption, and the positive effect of fish consumption, than the neurotoxic effects of mercury,” explained Júlvez. Júlvez said the findings don’t necessarily suggest women should start eating 600 grams of fish each week. In fact, the benefits of eating fish seemed to taper off when women ate more than 600 grams. The study highlights the importance of incorporating fish into your diet when you’re expecting. More studies need to be conducted before scientists can be sure the positive health benefits of fish outweigh the health risks posed by mercury and PCBs. If you’re pregnant, sticking with low-mercury fish, such as salmon, may be a good idea. 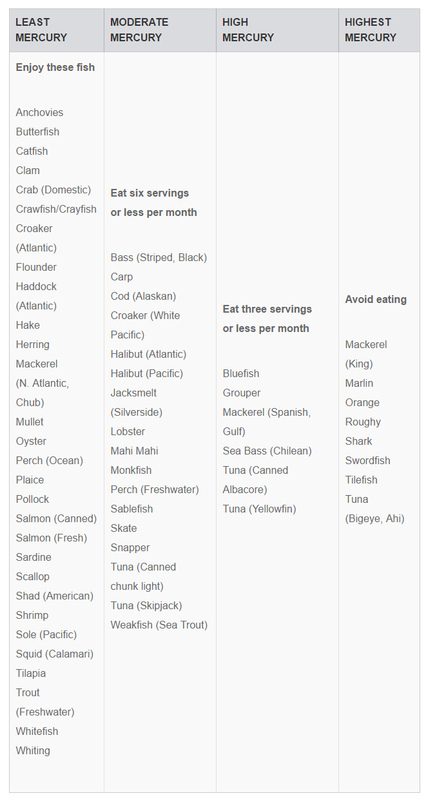 Here, the Natural Resources Defense Council has a list of fish with the lowest levels of mercury. Omega-3s are definitely beneficial. My concern would be in getting them from fish. 1) Fish and other marine life from the Gulf of Mexico sill show deformities, lesions, black spots, etc. as a result of the BP ecocide. 2) Many fish farms are very unsanitary. 3) The oceans are contaminated by radioactivity from Fukushima; half-lives can be thousands of years and more.